Experience in the use of low-frequency ultrasound in the treatment of infected wounds is analyzed. Evidence is presented supporting cavitation as the primary cause of the therapeutic effect. A new concept for the organization of feedback in ultrasound instruments based on controlling parameters of the cavitation zone is proposed. Translated from Meditsinskaya Tekhnika, Vol. 52, No. 6, Nov.-Dec., 2018, pp. 24-27. 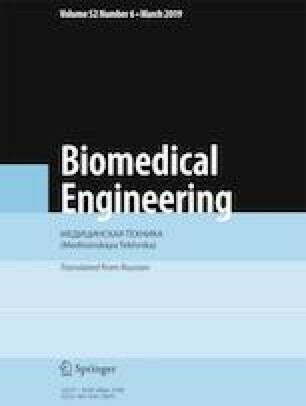 Pedder, V. V., Khrustaleva, E. V., et al., “Studies of the effects of low-frequency ultrasound, ozone/NO-air mixtures and their combinations on the leading pathogens of the ENT organs,” Med. Obraz. Sibiri (electronic edition), No. 6 (2013); http://ngmu.ru/cozo/mos/article/text-full.php?id=1200.